August 1, 2013 — (Reston, Virginia) — Practice Greenhealth announced today that Sterilmed has signed on as a supporter of one of the non-profit’s major initiatives focused on greening the operating room. Sterilmed, a leader in the reprocessing industry, is the latest business to join the Greening the OR® Initiative. Reprocessing single-use medical devices is one of the strategies identified to not only significantly reduce the environmental impact of the OR, but also to reduce supply costs by almost 50 percent. 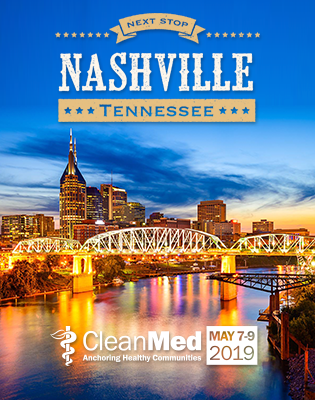 In conjunction with joining the Greening the OR® Initiative, Sterilmed is sponsoring an award for outstanding OR sustainability efforts to be awarded at CleanMed 2014. Hospitals showcasing superior OR sustainability improvements and outcomes are eligible for this honor. Hospitals are energy and resource intensive, and operating rooms are the largest users of that energy. They are also a major consumer of resources, using as much as 56 percent of a hospital’s total budget. In addition, operating rooms produce a disproportional amount of waste — between 20 and 30 percent of a hospital’s total waste volume. To help hospitals run more efficient and environmentally-friendly operating rooms, Practice Greenhealth introduced the Greening the Operating Room® Initiative, which helps hospitals reduce environmental impact, reduce costs, increase efficiency, and improve worker and patient safety. Sterilmed joins a large number of participating hospitals, healthcare companies, for-profit companies, and group purchasing organizations that are working to implement large scale green efforts to reduce waste, trim water and energy use, and create markets for EPP products. Practice Greenhealth is the nation’s leading membership and networking organization for institutions in healthcare that have made a commitment to sustainable, eco-friendly practices. To learn more about Practice Greenhealth’s Greening the OR® Initiative, visit www.greeningtheor.org. Sterilmed partners with healthcare facilities to deliver maximum cost savings through proven, simple solutions that drive economic and environmental sustainability. As an FDA-regulated reprocessor, Sterilmed is held to the same standards for cleanliness, sterilization and functionality as the original equipment manufacturer. Sterilmed enables hospitals and medical facilities to reduce device costs and medical waste, allowing healthcare facilities to free up critical financial resources while maintaining the highest levels of patient safety. Sterilmed is a member of the Johnson & Johnson Family of Companies. For more information, please visit Sterilmed.com.